I was born in the old-world seaside suburb, Fish Hoek, Cape Town. Living in close proximity to the ocean, I was incredibly lucky to always have an interaction with nature and the outdoors. After school I attended Stellenbosch University and graduated with a B.Comm in Accounts and Economics, which was a miracle, given my inability to sit still for more than a minute. I then went on to cut my teeth as a financial manager at both Dowson and Dobson and Go2Africa. It didn’t take long for me to realise that finance was clearly not my passion or my dream, however, and in 2004 I started Rhino Africa around my kitchen table. This was an opportunity for me to combine my love of Africa, conservation, photography, and travel, with my more astute business brain. The company is now Africa’s leading authority on luxury travel and continues to grow and innovate at a rapid pace. At the end of the day, I am motivated by my passion for conservation. 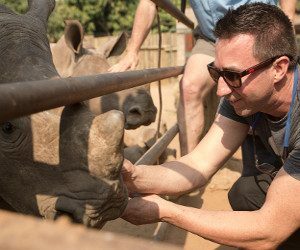 I have strong ties to the conservation efforts for the endangered rhino, and a big focus on rural education in South Africa. Through the success of Rhino Africa, I have been able to contribute to the causes I care so much about, as well as showcasing Africa and her incredible people, wildlife, and landscapes to the rest of the world.